To view the video footage that Phil, who was hit in the head with a rubber bullet, was filming when he was shot click one of these links: Streaming. Download. In the clip you can see how close the demonstartors were to the soldiers when the soilders opened fire – the sound of the shots fired is clearly audible. “I saw blood gushing out of his head, and helped bandage it. As we were getting him into the ambulance an Israeli soldier grabbed his long hair and they all tried to stop him from leaving in the ambulance even though they knew he was injured”, said American eyewitness Zadie Susser who saw Phillip Reiss from Austraila sitting in shock immediately after he was hit. 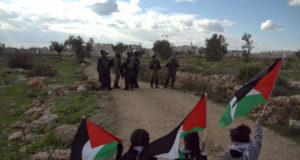 At today’s Bil’in demonstration, Israeli soldiers shot seven Palestinians with rubber bullets. One Australian and one Danish demonstrator were hospitalised after being shot in the head with rubber bullets at close range. AFP Cameraman Jamal Al Aruri was shot in the hand with a rubber bullet while he was filming two of his fingers were broken. Adeba Yasin (65) was hit by a rubber coated bullet under her eye while she was sitting on the balcony of her home. Phillip Reiss (25) from Sydney, Australia was shot as he was running away – he had been filming the demonstration. BJ Lund (21) from Ry, Denmark was also shot as he was standing near army jeeps. Both Phil and BJ are currently in Tel Hashomer hospital in Tel-Aviv. The bullet caused a hemorrhage to Phil’s brain, though he is now conscious. BJ required stitches to the head. 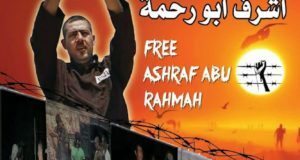 Ashraf Muhammed Jamal (24) was hit by a tear gas canister aimed at his head. 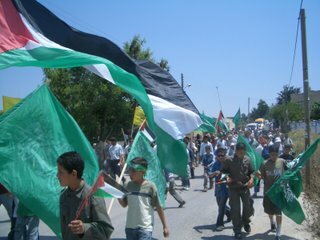 The demonstration of about 300 people had marched, singing, chanting and waving flags to the gate in the apartheid barrier. This week, the gate had been locked open, so the Israeli soldiers relied on their jeeps and barbed wire to stop the people of Bil’in from walking into their land. After a while, some of the demonstrators started to open the barbed wire. 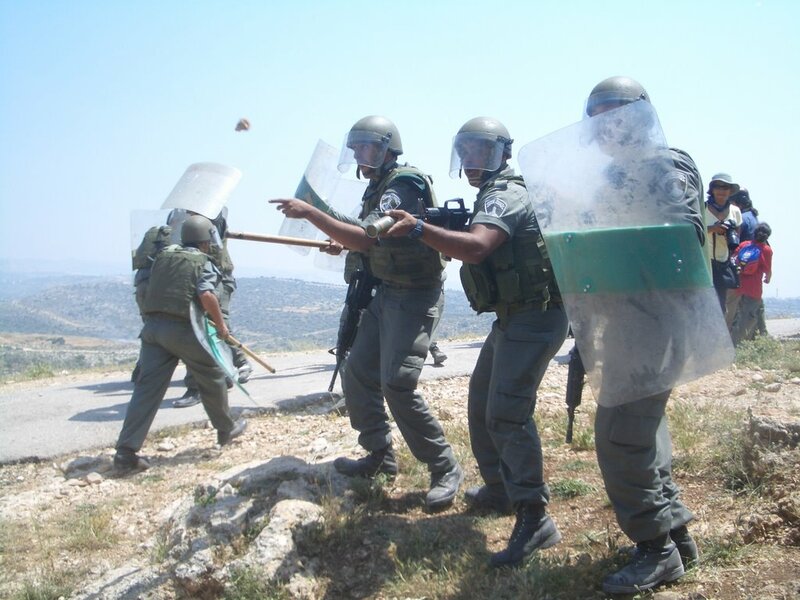 The Israeli soldiers started hitting people with clubs. A few rocks were thrown from a small group of youth who were away from the main demonstration in front of the jeeps. The soldiers then started firing on the peaceful demonstrators at near point-blank range as they were running away – they were a maximum distance of 10 meters away when shot. The Israeli military usually uses rubber bullets during demonstrations when Israeli and international activists are present. 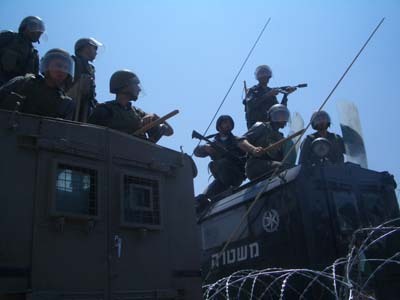 When Palestinians demonstrate on their own the military uses live ammunition or rubber coated steel bullets. Eleven Palestinians have been killed by Israeli soldiers during non-violent demonstrations against the apartheid wall. 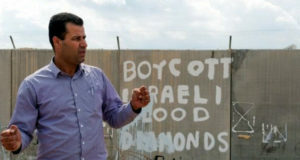 In a separate court case brought by the village and Peace Now against the new settlement of Matityahu Mizrah, the High Court was told of a land-laundering scheme that allowed the real-estate dealers and settler organizations to convert private land – “purchased” sometimes through dubious means – into “state land..” Then, before the construction of the separation barrier, the land was “returned” to the buyers so that they could establish facts on the ground and press the Defense Ministry into moving the route of the fence to the east of the new illegal neighborhood. According to Israeli newspaper Haaretz, hundreds of millions of dollars are believed to have changed hands in the affair.